If you're like me, you're not too excited about paying $10 for a juice or smoothie. 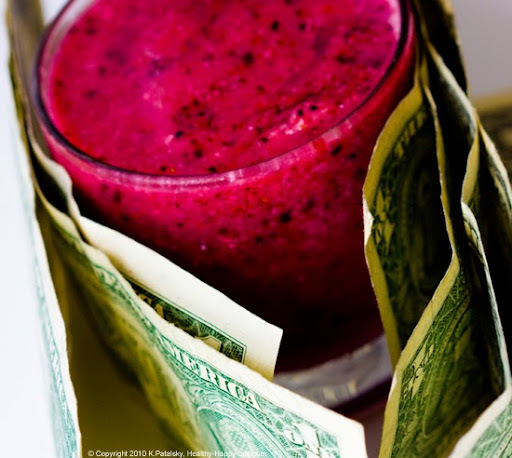 But $10+ is the going rate for a new generation of posh, glam, eco-chic juice bar sips. Juice Bar Gone Glam. The old 'juice bar' stereotypes: smashed. Or should I say, juiced. Mainstream award-winning chefs like Jean Georges are embracing the juicing trend. JG's new NYC green eatery ABC Kitchen hosts an in-house juice bar called Elixir. The elegant fluorescent pink, green and gold-colored juices are made with locally-sourced ingredients. Plus, the high caliber juices are blessed with the JG stamp of approval. SeriousEats calls the menu somewhere between Jamba Juice and Per Se. Nice line. Paying (and sipping) the Price. Last weekend my husband and I took a long walk downtown and ended up on the west side by Chelsea Market. It was hot and I was thirsty. So I decided to head to the One Lucky Duck juice bar inside the market and get a juice. I grabbed a bottled Swan Greens from the fridge shelf and paid the $10 price tag. I chugged the entire juice in just a few seconds. My husband gave me that look of, "Wow." One swift sip and ten bucks, gone. But the payoff was that I was utterly rejuvenated and refreshed with nutrient-rich juice. The lesson: you get what you pay for. 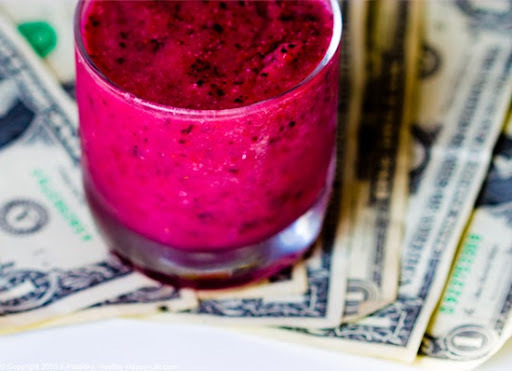 But, could I afford to drop $10 a few times a day for juice - even really good juice? No. Thus why I invested in a high quality juicer, to make juices at home. Side note. Perspective: Drink for Thought. Don't shrug off the pricey juice bar sips all together though. 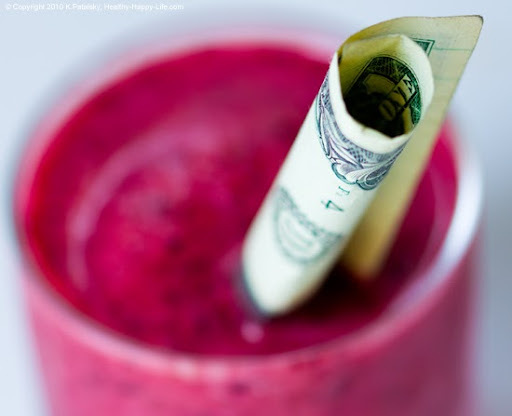 I'm all in favor of high quality juicing - I mean most people pay $8, $10, $15+ for a fancy-schmancy alcoholic cocktail, so why not the same for a juice/smoothie? I've paid for more that a few really bad $15 cocktails in NYC...I would've much rather paid for a $10 extraordinary juice -and keep the change. The coconut trend continues, with no signs of slowing. And if you can find a pointy-shaped, whole Thai young coconut- and a sharp reliable 'coconut' knife, you're halfway there to glam-juicing bliss. Kristen's Raw has a nice how-to video on opening a coconut. Not only is fresh coconut water and coconut meat delicious, but it's incredibly healthy. Coconut Water Facts. How do you use it? Scoop out the white coconut 'meat' or 'flesh' and blend it into a smoothie or raw soup for a rich and creamy texture. One of my favorite simple raw soups is made from coconut meat, coconut juice, avocado and sea salt. So good. Use coconut water in juices or smoothies. Or make my fave coconut water ice cubes. Where to Buy: Whole Foods, Natural Foods Grocers and Specialty Stores. Also online: Melissa's Fresh Young Coconuts, Set of 3 for $26. Yuzu is a tiny citrus fruit that is beaming with high vitamin C content. It is a super trendy ingredient in juices, smoothies and cocktails. Yuzu is definitely a tricky fruit to find in stores - but if you can get your hands on one, you'll be swimming in glamorous citrus juice bliss. Blend the yuzu with orange, grapefruit and Meyer lemon for a mouth-puckering morning wake up call that will leave your fresh squeezed OJ in the dust. Where to Buy: You can find whole Yuzu fruit at specialty stores and Asian markets. You can also buy it online. 6 yuzu for $29.99 can be bought here. Or is you are really desperate, you can buy Yuzu Juice online. But fresh fruit is recommended. Trend Spotted: Any elite cocktail list will boast this citrus delight. And now juice bars are catching on the trend. 3. Exotic Nut Milks. Homemade. Soy milk is sooo last decade. And almond and rice milk are becoming passé as well. OK, I kid. I adore soy, almond and rice milk as go-to dairy free staples for my smoothies. But if you really want to glam it up, try making your own nut milks. Fresh almond milk, Brazil nut milk and fresh walnut milk. Perhaps try some pecan, macadamia and even hazelnut milk. Sounds interesting, right? How about a creamy fresh walnut milk, coconut meat, cacao nib nut shake with some grade B maple syrup? 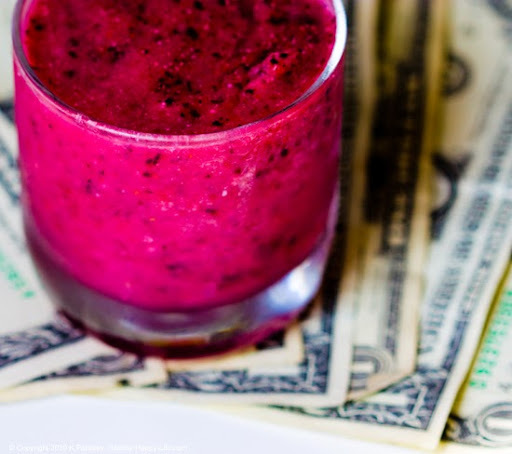 ...now that's a swanky smoothie. Where to Buy: You can find raw nuts at almost any grocery store. Here's a good how-to video on homemade nut milk making, from We Like it Raw. Trend Spotted: Elixir, ABC Kitchen has a homemade walnut milk on their menu. Many vegan restaurants and juice bars have several rotating fresh nut milks. 4. Algae Flakes and Spirulina. For a bright green, nutrient-flourishing boost to your juice or smoothie, blend or stir in some algae. 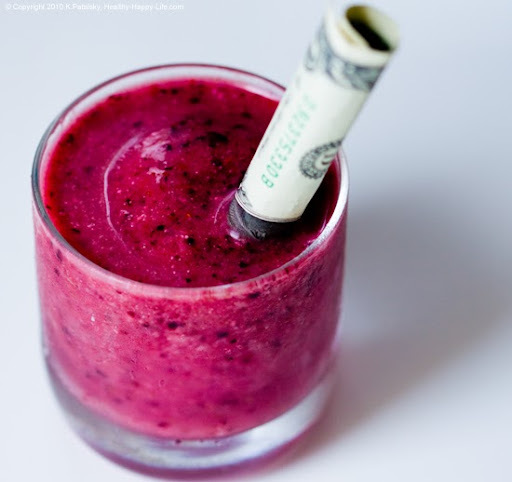 Don't worry the impact on color (and nutrition) will be more obvious than the impact on taste. I'm a big fan of spirulina, and even those green smoothie powders. Green Powder Taste test. Where to Buy: Natural Food Stores in the supplements section. Trend Spotted: You'll find blue-green algae flakes on the menu at Elixir. And spirulina as an add-in ingredient at Liquiteria. 5. Exotic Substitutes for the Ordinary....and Getting Creative. Instead of using apple juice. Use fresh pressed apple cider. Instead of a basic lemon, try a Meyer lemon. Instead of an orange, try a minola. Switch up a tangerine for a seedless pixie tangerine. Switch up your shelf-stable grape juice for some fresh-pressed concord grape juice. Instead of cranberry juice - try cherry juice. Switch out your green juice spinach for some green juice kale, wheatgrass or chard. Change out that banana for a red burro banana. Switch out frozen peaches with frozen apricots. Instead of navel oranges, try blood oranges. Use dried goji berries instead of raisins. Juice green and purple striped heirloom tomatoes instead of cherry or roma tomatoes. Going tropical? Change up your pineapple for an exotic sweet cherimoya. Get the idea? Traditional fruit and veg flavors can be amped up simply by trying the 'more exotic version' of a similar fruit. Where to Buy: Check the 'exotic' fruits section at your grocery store - or scour your Farmer's Market for fresh new finds. And most of all, you'll want to think creatively. Think outside the fruit bowl. And it doesn't have to be an exotic fruit to be a new, exciting and exotic fruit to you! Trend Spotted: Exotic, interesting fruit change-ups are everywhere. Aloe juice is all the rage. I love adding aloe juice to my smoothies. And luckily, the trend is catching on. Several juice/smoothie bars are adding aloe as an optional "add-in" ingredient. Aloe's health claims are wide, varied and unconfirmed - but digestion, amino acid supplementation and immune function are a few of the claims. FYI, Aloe used topically is not the same as aloe juice processed for consumption - same source of the aloe plant though. Where to Buy: Whole Foods, Natural Health Food Stores will sell bottled aloe juice. I suggest going for the unsweetened/unflavored varieties. Trader Joe's sells canned aloe. Trend Spotted: Liquiteria in NYC offers an aloe add-in and Elixir has Aloe on its menu. Huge trend on all the swanky juice and even cocktail menus: pairing a traditional flavor with an herb or a spice. The big flavor combos to try: Basil and lime. Thyme and lemon. Grapefruit and tarragon. More ideas: fig and black pepper. Pear and mint. Cucumber and rosemary. Spinach and chive. Strawberry and chile pepper. Jicama and mint. Jalapeno and Green Apple. Or even, peach and cayenne. Yum..creative juices are flowing. Where to Buy: Any grocery store. Simply pair some fresh herbs and/or spices with traditional juicing and smoothie ingredients. Trend Spotted: JG Elixir bar loves this idea. You can find the herby combo in both their juices and cocktails.